John McCutcheon resurrects Joe Hill's rabble-rousing songs. Almost a century ago, the socialist journalist John Reed wrote of the Industrial Workers of the World—popularly known as the Wobblies—"Remember, this is the only American working-class movement which sings. ... They love and revere their singers, too, in the IWW. All over the country, workers are singing Joe Hill's songs." Hill, the IWW's unofficial songwriter, had been dead three years when Reed penned those words. Born in Sweden in 1879, he immigrated to the United States in 1902. His songs were written and sung to inspire workers and further the IWW's goal of organizing the working class into One Big Union. He was convicted on scanty evidence of murdering a Salt Lake City grocery clerk and his son, and sentenced to death by firing squad at Utah State Prison, on the site that is now Sugar House Park. Thursday, Nov. 19, is the 100th anniversary of that execution. 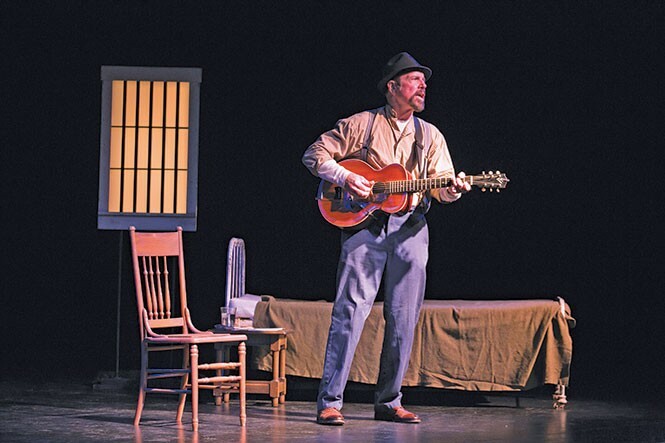 In tribute, six-time Grammy nominee John McCutcheon will re-create Hill's last night in Joe Hill's Last Will, a one-man play based on Hill's writings and songs, written by community organizer and folksinger Si Kahn. McCutcheon released a CD on May 1, also titled Joe Hill's Last Will, featuring the songs heard in the play, including Hill's "The Preacher and the Slave," "There Is Power in a Union" and "Rebel Girl," as well as such obscurities as "What We Want" and "Overalls and Snuff." Hill is difficult to understand by today's standards, says McCutcheon. "He was a different animal. He never did a gig. Was never on the radio. Never made a recording. Didn't do anything that would further his artistic notice. He wrote to be useful, nothing more. He is a complete anachronism in 21st-century terms." For Wobblies, music was a weapon in the class war, and proved essential in organizing campaigns. "A pamphlet," Hill once wrote, "no matter how good, is never read more than once, but a song is learned by heart and repeated over and over." As McCutcheon explains, "you had a large immigrant workforce with songs that held great emotional meaning to these workers. Utilizing those melodies, with words fitted to immediate concerns, was very powerful. Think of the music of the Civil Rights movement; the song sources had tremendous, spiritual and historical power to people which, in turn, lent that foundational power to their usage in new contexts with slightly altered words. Same thing with IWW songs. They understood that people need information, but they also need emotional connection." The songs reflect Hill's gift for vernacular—an especially impressive accomplishment, given he was not a native English speaker. But as McCutcheon says, "When you hang around with people who don't speak the King's English—especially workers who are making nicknames up for one another, giving descriptive and often scatological nicknames to jobs that they have to do—you end up having an ear for the vernacular. Hill certainly seemed to have a gift for that." Hill drew on a wide range of influences in composing his songs, from Tin Pan Alley and vaudeville to ethnic music and popular hymns, often depending upon audience and situation. His most famous song, "The Preacher and the Slave," was written during an organizing campaign in Spokane, Wash., during which members of the IWW and the Salvation Army often stood on streets near each other competing for the same audiences. Local company bosses began paying the Salvation Army to drown out the Wobblies. "Joe Hill decided if you can't beat them, co-opt them," McCutcheon observes, "and wrote new words to 'In the Sweet By-and-By,' which was one of the most popular songs that the Salvation Army was playing, and got all the men singing his words to the hymn. It was partially a matter of necessity, because it doesn't matter how loud you sing, three trumpets, two trombones and a bass drum are going to drown you out, so you find a way to use that to your advantage." McCutcheon's performance also includes the remarkably contemporary take on working-class conservatism, "Mr. Block," the worker whose loyalty consistently lies with the bosses. "One of the most interesting things about doing this ... is the reaction it gets from younger people, college-age people, who say, 'All that stuff was going on 100 years ago, and we're still dealing with it today?'" Throughout Hill's oeuvre runs a sharp sense of humor, which served both entertainment and political purposes. In McCutcheon's words: "Humor is a powerful weapon. It allows the weak to reduce the powerful to manageable size. Plus, the powerful, for some reason, rarely have a sense of humor. Humor makes them vulnerable and, ultimately, conquerable. When you show them you're not afraid, they don't know what to do. That was a great gift that the Wobblies gave to the American labor movement, and we could use a hell of a lot more of it now." David Cochran teaches history at John A. Logan College in Illinois.